Most people would be embarrassed if they were caught photo-shopping their image on a national magazine cover to look important. Our president (it really hurts to say that) could care less and is currently displaying a fake (fake news?!) Time Magazine cover with his smiling mug on it, looking smug with arms crossed, in the lobbies of five of his golf course lobbies. 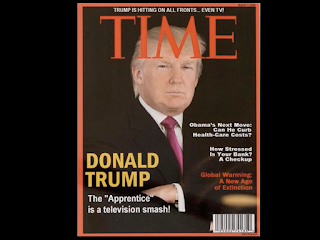 Apparently Time Magazine didn't appreciate the gag (if that was what it was) and asked the Trump Organization to take down the phony magazine covers featuring a pre-presidential Trump. 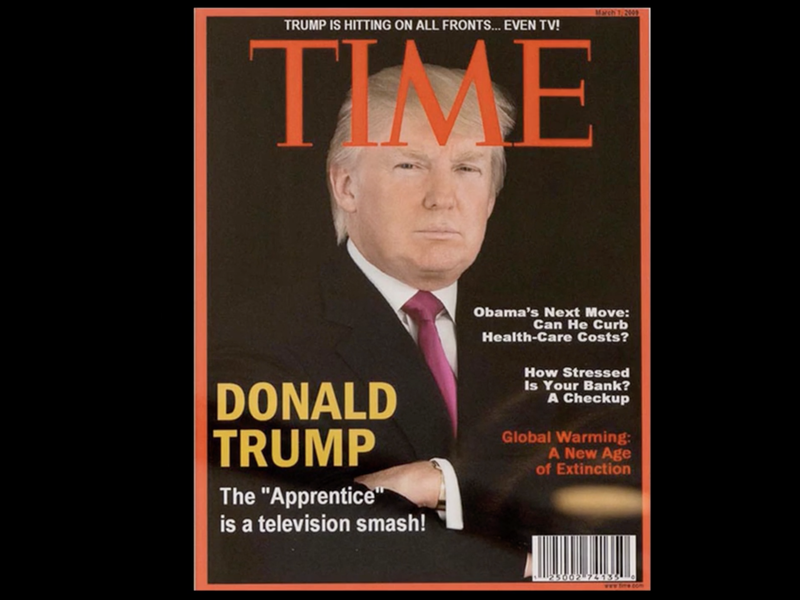 The newsweekly made the request after The Washington Post reported Tuesday that at least five Trump properties had hanging a Time Magazine cover showing Trump. But the magazine covers, dated March 1, 2009, were fake. The magazine did not publish on that date; its March 2, 2009 issue featured actress Kate Winslet. Either Time Magazine has no sense of humor, or a desire to repent for the actual issues they did run featuring The Donald. In any event, the request was considered newsworthy by a lot of publications. The whole affair is sad. That America has a full-blown narcissist and serial liar for a leader is the stuff of a Greek tragedy where the crazy king attacks his allies, and mistreats his people and the environment, in the name of money. President Ronald Reagan was famous for telling the Russian leader, Gorbachev, to take down the Berlin wall dividing the East and West of Germany. In a humorous, and nearly parallel way, Time Magazine has made history with their call to a sitting president to take down those fake covers with his bloated mug on it.